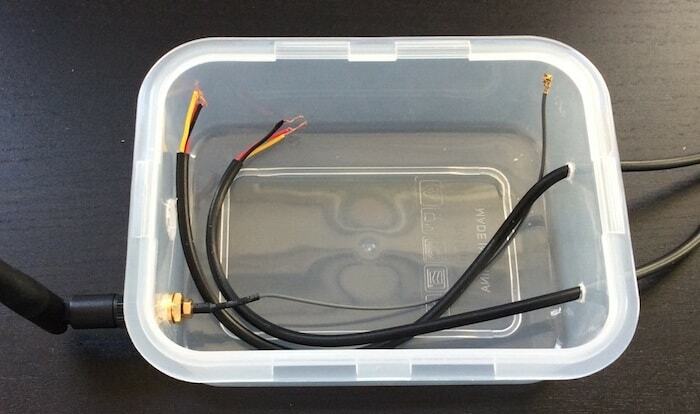 Summary: Part one of my custom built external water bath monitor for sous vide. 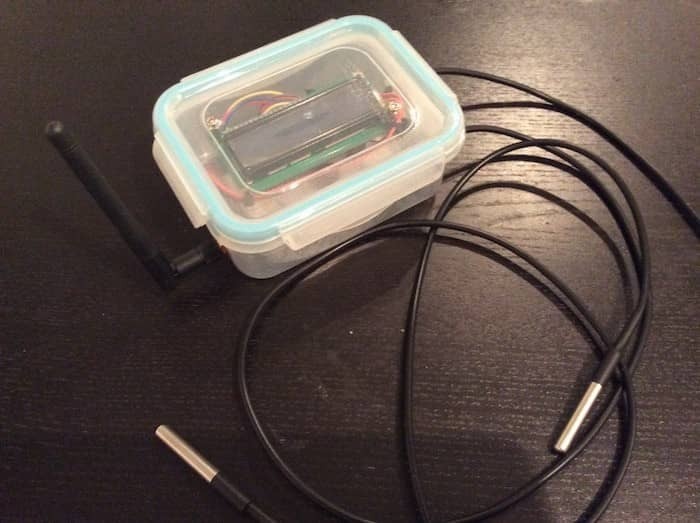 Running on a Spark Core and using DS18B20 temperature sensors for measurements. In this blog post I’ll show my latest project: a custom built external water bath monitor for my sous vide setup. 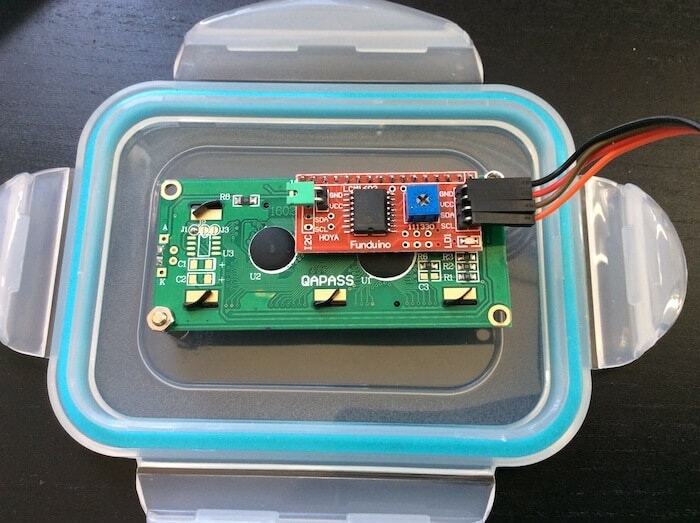 It runs on a Spark Core and makes use of the DS18B20 temperature sensor. Not sure what sous vide is? Its an essential cooking method in the modern cuisine! I’ll start of with the hardware aspect of the project. Next time I’ll focus on the software and programming my new device. Sous vide cooking is perfect for (extreme) long cooking times and can transform a cheap cut of meat to a steak-like quality. Roast beef is a nice example of this. Instead of using an oven you cook the roast for 12-24H in a water bath to make it tender. There are many things that can go wrong (power malfunction, water level to low, etc.) with a shutdown due to evaporation being the most probable. Usually some kind of monitoring is required to assure a successful end result. In fact, the last time I did this my sous vide cooker broke down at random intervals which required me to check it every hour or so. To prevent me getting up in the middle of the night checking on my cooking process, I came up with a solution: an external water bath monitor! 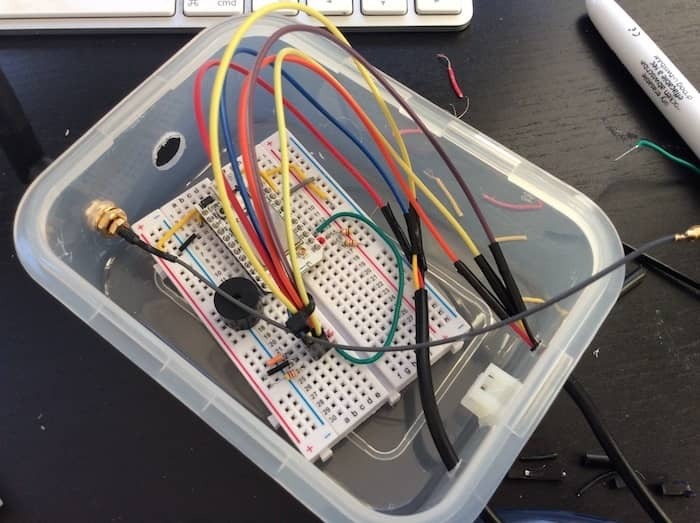 In this post I’ll show you the system that I built: a device, independent of my sous vide setup, that monitors and reports to me when anything suspicious occurs. Water level to low? → Sous vide device stops and temperature decreases. Something wrong with the circulation? → The water bath will have different temperatures at different points. Or only has the correct temperature close to the device. Power problem? → No heating, so temperature decreases. In other words, if we monitor temperature and report any changes we can catch most events that occur! 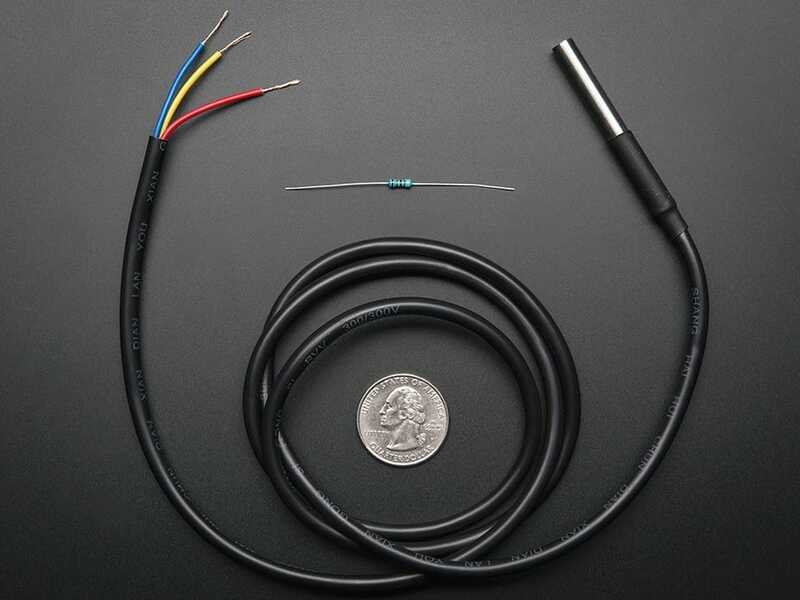 I started my search and came across the DS18B20 temperature sensor which is available in a waterproof version: perfect for monitoring the temperature of a sous vide water bath! For example available through the Adafruit store. It has a PVC tube which doesn’t make it food-safe, but it won’t come into contact with food as everything is packaged in bags. Second part is the reporting. I want to know, even when away from home, when something goes wrong. So, anything that can show the current status of the system on my phone would be great. Luckily, I had a Spark Core laying around from the original Kickstarter they did. It has WiFi support so that covers the reporting part of the system. 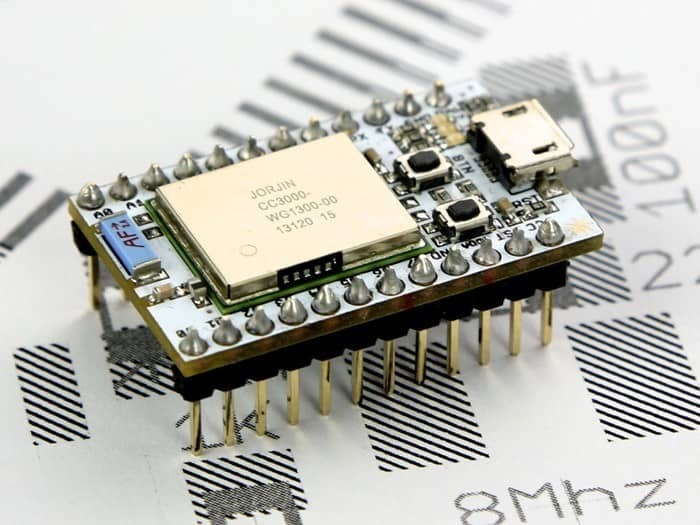 Powering the Core (and other components) is done directly through USB. 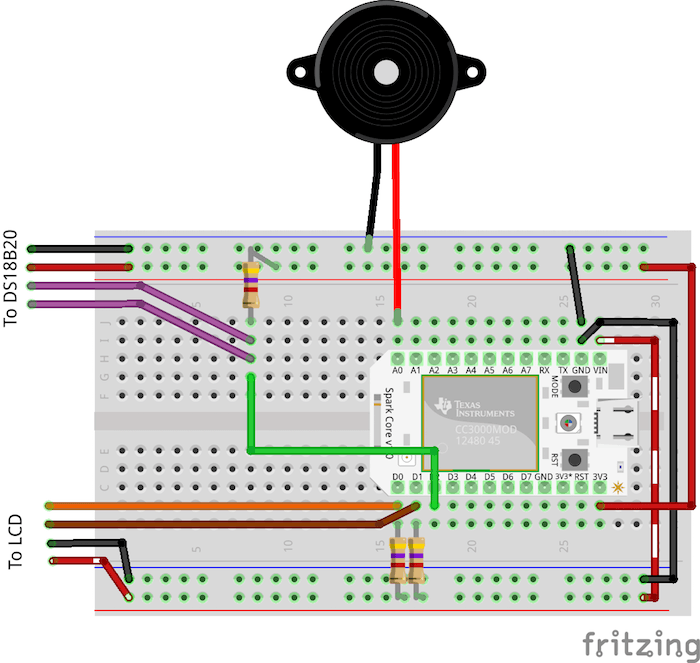 The circuit is fairly simple as the component list is short. We do however need to separate the 5V and 3.3v power lines. 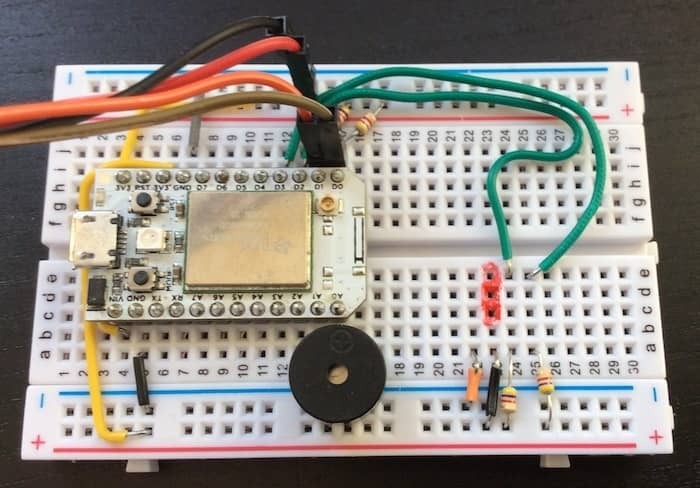 Both temperature sensors are connected to a digital pin (D3) on the Spark Core with a pull-up resistor (4.7k) to the 3.3v pin. They will use the Dallas OneWire library so multiple sensors can work with a single pin. The LCD screen uses I2C and is connected to the corresponding SCL and SDA pins on the Core (which are D0 and D1). As the LCD screen needs 5V to work, its Vin pin is connected to Vin of the Core (which is 5, directly from the USB). Both I2C pins have a pull-up resistor to Vin. I installed the whole circuit on a breadboard. For a moment I considered perfboard but I first want to do some more test runs before making the circuit really fixed. So that’s that! My two-channel monitor is complete and I am really happy about how it turned out. The total build cost me around two afternoons, including some programming and testing. I can now monitor two water baths or a single bath at two points (usefull for large containers). Next step? Software! But, I will cover that in the next post.